Explorations of the more distant areas of the Newtown Pentacle are consuming. Of late, I find myself wandering the vast corridor of Roosevelt Avenue, which of course connects to the historic Greenpoint Avenue- running across the seldom commented border of Brooklyn and Queens- crossing that shunned strait referred to as the Newtown Creek, and heading for the distant East River. The view above is far from that storied waterway, as Roosevelt Avenue follows the Great Machine toward Flushing, and was shot in Woodside. Woodside is a neighborhood in the western portion of the New York City borough of Queens. It is bordered on the south by Maspeth, on the north by Astoria, on the west by Sunnyside and on the east by Elmhurst and Jackson Heights. Its ZIP code is 11377. Some areas are widely residential and very quiet, while others (especially closer to Roosevelt Avenue) are more urban. The neighborhood is located in Queens Community Board 1 and Queens Community Board 2. 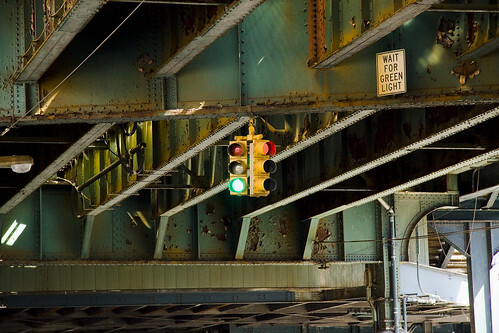 Not too far away is the Broadway intersection in Jackson Heights, near the very model of a major modern intermodal transportation hub at the Roosevelt Avenue 74th Street station. 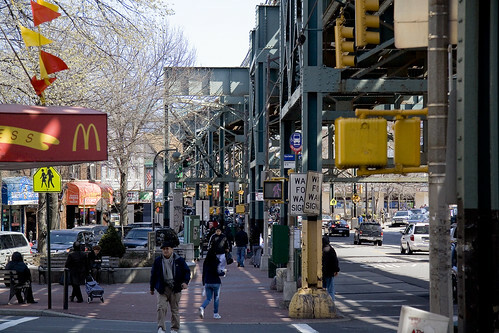 The Roosevelt Avenue-Jackson Heights is the one intermediate express station on the Queens Blvd Line, one of the most heavily used and crowded subway trunk lines. The station in addition to serving the large surrounding shopping district of Jackson Heights is also a major transfer point for passengers between express and local trains, to the number 7 line, whose local station at 74 Street-Broadway is located on its elevated structure above the station, as well as to six bus routes to surrounding areas without subway service, most of which begin and end in the station’s covered bus loop and layover area just outside the main station building entrance at street level. To facilitate this the station has two relatively narrow by IND standards for a busy transfer point island platforms for the four track line and a full length mezzanine that is almost still completely open with the exception of a small section of it at the extreme eastern end, albeit only the portion above the Manhattan-bound platform. Here some sort of non-public area has been carved out of the mezzanine and has been fully tiled over as part of the stations recent renovations. The mezzanine also has a number of glassed off areas along it, that were built probably to entice a shopping concourse to open within fare control, although the only stores there so far are some Bank of America ATMs and what looks like a record store. Ethnographic scholars treasure this corridor, serving as a cutaway of immigration and sociological patterns. One end of the street is the high modernity of Queens Blvd. in Sunnyside just a few blocks from 2nd and 3rd Calvary Cemeteries, and as it travels through Woodside, Jackson Heights, Elmhurst, Corona, past Citifield, and into Flushing- one sees a cross section of the entire planet’s human infestation. North American, South American, European, African, Asian, Polar- all the tribes of man are here. Incidentally, a surprising number of psychics, storefront healers, and ethno-religious peasant magick suppliers are observed along its route. A botánica (often written botanica and less commonly known as a hierbería or botica) is a retail store that sells folk medicine, religious candles and statuary, amulets, and other products regarded as magical or as alternative medicine. They also carry oils, incense, perfumes, scented sprays (many of which are thought to have special properties) and various brand name health care products. 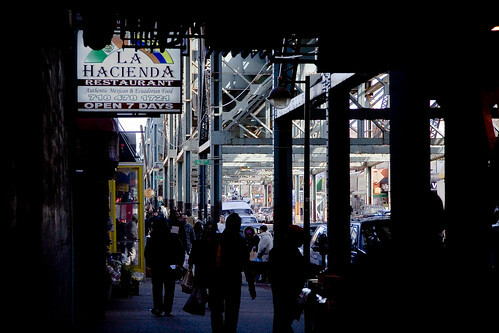 Botánicas now can be found in any U.S. city that has a sizable Latino/a population, particularly those with ties to the Caribbean. The number of botánicas found outside of New York and Miami has grown tremendously in the last ten years. The name botánica is Spanish and translates as “botany” or “plant” store, referring to these establishments’ function as dispensaries of medicinal herbs. Medicinal herbs may be sold dried or fresh, prepackaged or in bulk. Botánica almost always feature a variety of implements endemic to Roman Catholic religious practice such as rosary beads, holy water, and images of saints. Among the latter, the Virgin of Guadalupe and other devotional figures with a Latin American connection are especially well-represented. In addition, most have products associated with other spiritual practices such as candomblé, curanderismo, espiritismo, macumba and santeria.